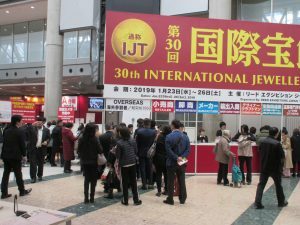 The 30 Anniversary of IJT was held at Tokyo Big Sight until 26th January. We exhibited at IJT Tokyo International Jewelry Exhibition. This year was the IJT 30th Anniversary and remains the most renown domestic exhibition. This time, due to challenges posed by US-China trade friction, the global markets, and the Euro, domestic and overseas buyers were cautious. It has been announced that for next year the venue will be changed to Western Hall due to the Tokyo Olympic Games. The next exhibition is in Hong Kong starting on February 28th.